Fluoride, aluminum, and other heavy metals can have a calcifying effect on the pineal gland in the brain. This glad in part sends signals that help you sleep. Trouble sleeping? Try to eliminate these toxic metals. 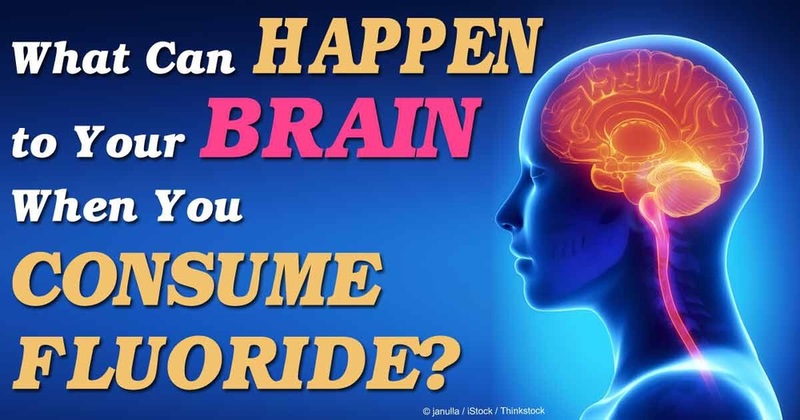 Click here to discover 10 ways to avoid fluoride in your diet! Is the flu shot a sound investment for your health? The flu shot may be more like a shot in the dark. In addition, the side effects may far outweigh the benefits from the shot. Click here to watch a short video by Dr. Sherri Tenpenny, an extremely educated doctor in the areas of immunity and vaccinations, and decide if the flu shot is right for you and your family. To the average consumer, grocery shopping can be a daunting task. With 22 aisles of goods and each one packed with bottled, canned, and processed foods, finding the best options to fit with both your budget and you health consciousness can be a daunting task. It doesn't have to be though, if you follow some basic guidelines. First, stick to the outside of the store. What this means is avoid those lines of aisles that tempt you when you first walk in. For the most part the aisles are what contain your processed and overpriced foods. The walls of most grocery stores are what contain your real foods: Meats, produce, dairy, etc... If you can stick to the wall of most grocery stores you'll be taking a huge step in the right direction. Second, stick to the basic principle of "foods by God". What this means is that even though those crackers might be whole wheat and organic, if they're in the shape of a zebra they probably have been pretty heavily processed and had most if not all nutrients removed. The more you will have to prepare the food, generally the better it will be for you. It might take some extra time but in the long run your body will thank you. Lastly, make lists and plan ahead. If you go to the store without a clear direction of what you need and what you will use it for, you will probably end up having to throw away spoiled foods you couldn't use or end up making extra trips to the store which will cost you time and gas, neither of which come cheap! Shopping for the good of your body and bank account doesn't have to be an enigma. With some basic planning, discipline and common sense you can become a regular health food extraordinaire in no time. The Stalnaker's story includes so much more than just Chiropractic. Take an inside look in this video. In most areas of athletics, the personal record is an important aspect of goal setting and accomplishment. PR’s motivate us to work harder and push ourselves to greater levels of strength and conditioning. It is easy to focus on the PR at hand, whether it be more pounds on your squat, taking a second or two off of your 500m row, or whatever the goal is. The general idea is that if you want to squat more weight, you need to squat multiple times per week and with heavy weight. This is true, but sometimes its easy to miss a very important part of hitting PR’s… the core. The core of the body is an incredibly important area. It stabilizes us, helps initiate proper movement patterns and can often times tell our body when something is too much. All of the tiny nerves surrounding the spine are constantly giving feedback to the brain. If that feedback is good, you will be able to push yourself harder, go faster, add more weight, etc., but if that feedback is poor, your brain might say enough is enough. Pushing through this can be dangerous and may lead to injury; won’t be hitting any PR’s on the injured reserve list. Spinal alignment and proper intersegmental motion is an important part of elite-level core strength. This is where a good chiropractor comes in. Chiropractors can detect misalignments in the spine and poor spinal movements and work to correct them. The spine is so important because it protects the spinal cord. This is where all that information is traveling so when you need those muscles to fire, your spine better be doing its job. Creating stability in the core takes work. By simply recognizing that we don’t engage our core properly throughout the day should help us be more proactive in getting our core stronger. Think the next time you go from sitting to standing. Engage your core prior to standing up. You will begin to make this a habit, and retrain your brain and body to engage the core more often. With the PR’s in sight you must make time to deliberately train the core. This means doing some of those exercises that we often don’t make time for. Planks and side planks. It seems too static, not enough resistance, but if you engage your core properly and hold a plank for 1 minute, 2 minutes, 3 minutes, etc. You will start moving closer and closer to hitting those PR’s. Straight leg raises starting with core engagement, slow and controlled, will help teach the core to stabilize first before big muscles move. Hollow body rocks, superman exercises, deadlifts (proper form), and L-sits are all great movements for the core. For the more advanced athletes, back extensions with resistance, evil wheels, and GHD sit-ups are great ways to add strength and stability to the core. Keep training hard. Set PR goals and work to achieve them. Remember, if you have hit a plateau, your body might just be telling you that your core strength needs to go to the next level. “The robust need for chiropractic care in the NFL has been deeply driven by the players’ desire for peak physical conditioning and not simply for injuries,” says Spencer H. Baron, D.C. This statement regarding the players’ views towards chiropractic demonstrates a growing trend toward implementing chiropractic into ones lifestyle for complete physical wellness and not simply injury recovery. A common misconception among people unfamiliar with the profession is that chiropractic is only used for treating spinal injuries. This is equivalent to saying that dentists only treat cavities and pull rotten teeth. NFL players and laymen alike are realizing that chiropractic care is crucial for maintaining their spine and for allowing their body to function at %100. All thirty-two NFL teams now officially utilize the services of a chiropractor in their care for the patients. In the past, it was rumored that chiropractors had to meet the players in hotel bathrooms and back alleys. Now, however, they share the training room or even the locker rooms with the players. With a surge of recent research into effects of the heavy hits taken during an NFL football game on the players’ brains, it is not surprising that a growing care for the nervous system has also been occurring. It is said that a lineman’s body goes through the equivalent trauma of a severe auto accident every game, so corrective care becomes crucial in the care for the player’s most valuable asset: their bodies. In summary, professional athletes enjoy top notch physical care in a profession that demands enormous amounts from their bodies, and it isn’t surprising that chiropractic care is a key aspect of this care.